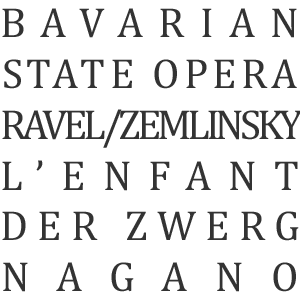 A wonderful—because rare and original—double bill at the Bavarian State Opera: Ravel’s L’Enfant et les sortileges and Alexander Zemlinsky’s Der Zwerg. Ravel’s 45-minute tale about the unruly child, its nightmarish-fantastical visions, and eventual repentance is an adorable and lyrical feast for the ears… at least throughout part II, the dream scene in which the animals and pets come to life. 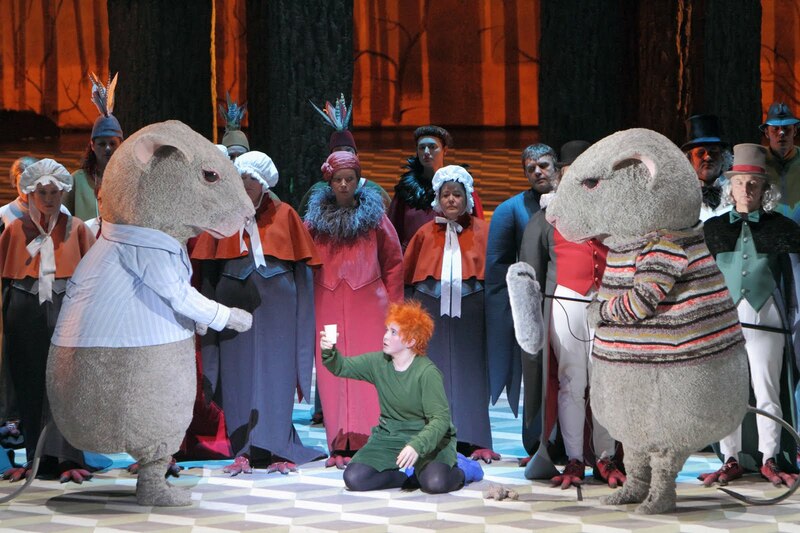 Perhaps the most enjoyable aspect of the whole night are the animal costumes Anna Nykowska Duzsynska created for Grzegorz Jarzyna’s production. 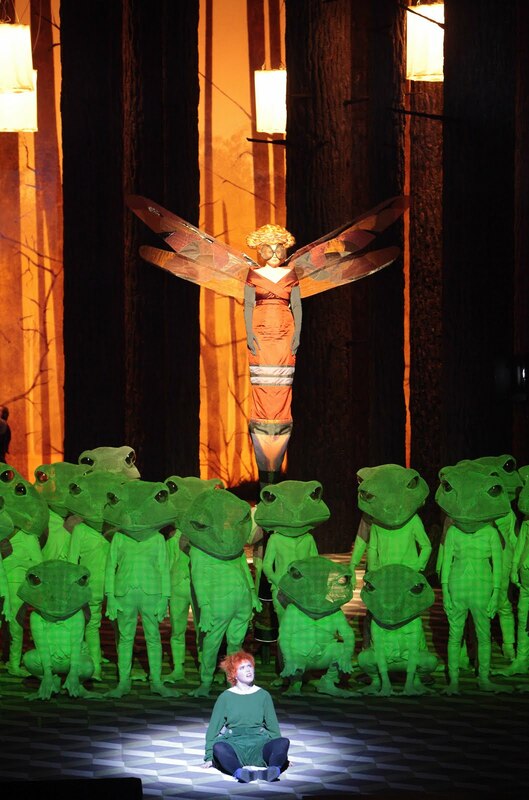 When Kevin Conners’ Frog gets to give his Squirrel-love Angela Brower a peck, it’s cute enough to make hardened hearts melt—amid very solid singing and a willing, enthusiastic orchestra under Kent Nagano. 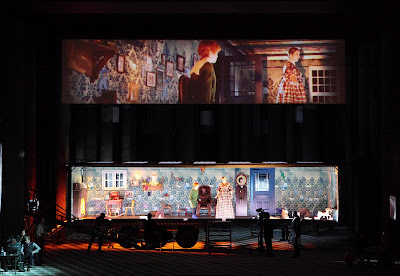 Grzegorz Jarzyna opens the opera as a film set where a Walter Felsenstein-esque opera movie of “L’Enfant et les sortileges” is being shot—shown on a wide screen above the set. That would make sense if it had a child movie star gone wild at its center… an obnoxious little brat (as they invariably are) with his tantrums thrown at the stage-trailer, abusing the film crew and director around him. But that’s not the case; the child merely acts its role within the film-within-the-opera. Is it a way to present a realistic version of something unrealistic? Or is the ‘acting’ perhaps the excuse for its behavior and the explanation for its ‘repentance’? If the latter, it would rob the opera of its entire, sole point… so perhaps this first part—also the musically less gratifying—is better not pondered. The costumes are inventive but the characterization of the Wedgewood teapot, for example, is insufferably clownish; some of the voices—the Fire (slightly better, later on, as the Nightingale) and the Kid (Tara Erraught)—were not impressive. All that is forgotten by the time film director and sound technician enter within the dream, metamorphosed as ridiculously adorable fattened prairie dogs or some such creatures. I love the music of Alexander Zemlinsky (1871 – 1942). How superb to get to hear (!) 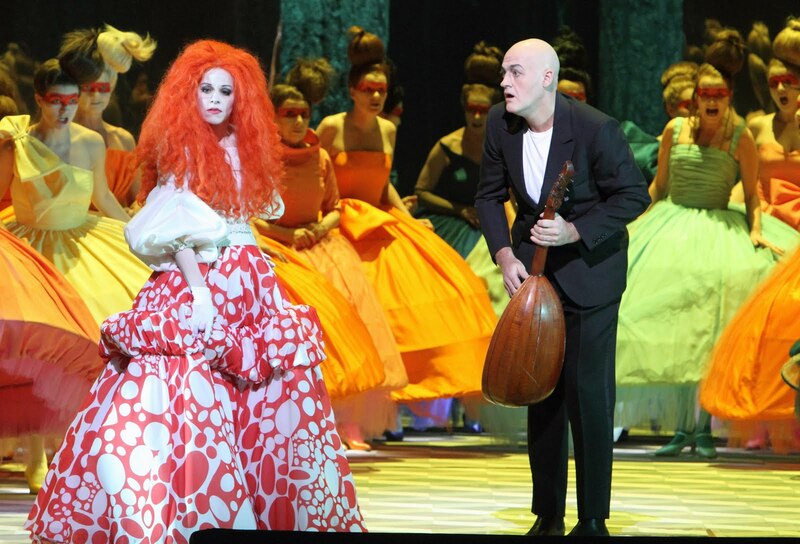 his third-last opera, “The Dwarf”, (incompetently) adapted from Oscar Wilde’s short story The Birthday of the Infanta. 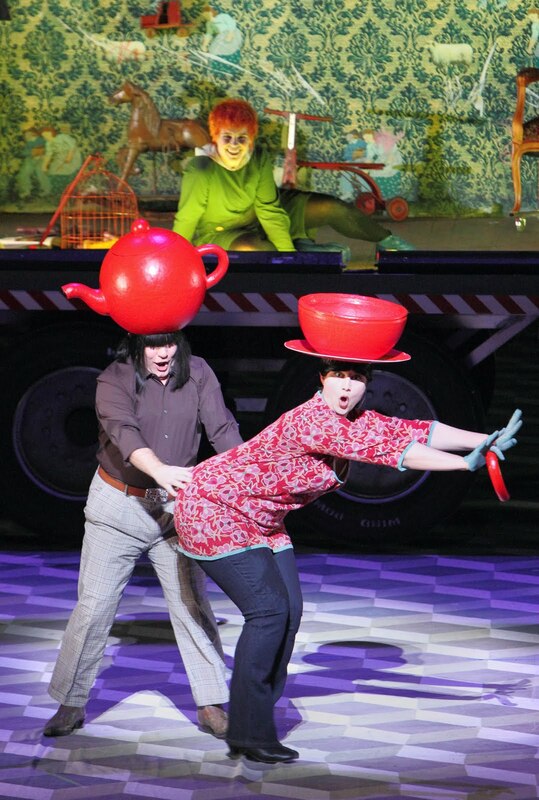 It’s really, really too bad it’s not a particularly good opera. 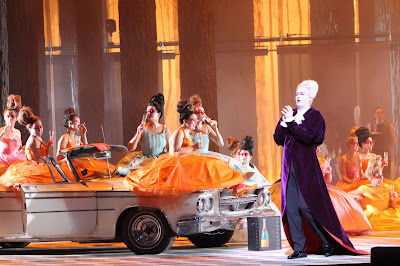 Or at least not a good enough opera to make a lasting impression on stage with a direction that had spent its main ideas on Ravel and gave Zemlinsky a very accomplished, professional treatment but not much imaginativeness. 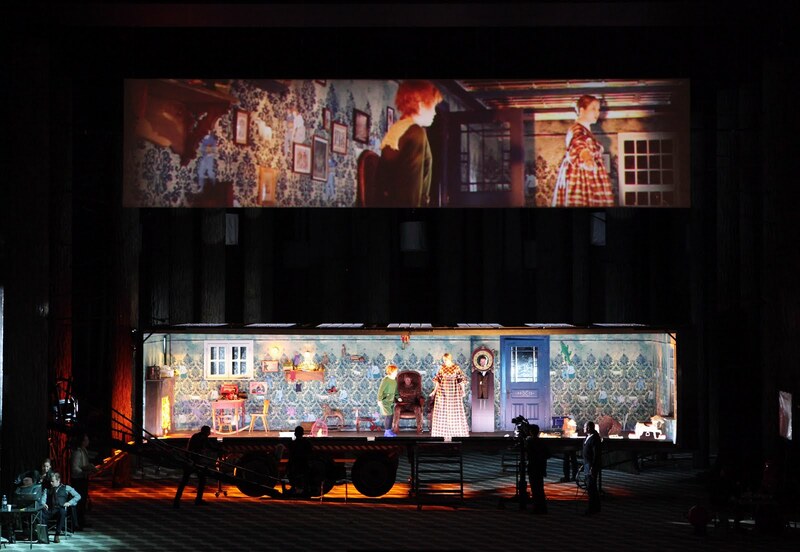 As a stage work, Der Zwerg—lacking that bit of added sophistication that the operas of his contemporary Franz Schreker (1878 – 1934) contain—can’t get by on craftsmanship alone. Fortunately the music can. Written between 1919 and 1921, there are musically analogous moments to Richard Strauss (melodies for the voices and solo instruments), Gustav Mahler (orchestral color, including the use of mandolin) and Richard Wagner (harmonies). After a few bars of smug marching music, the lyrical, sweet, wallowing, romantic gene of Zemlinsky inevitably breaks through and doesn't leave until that dwarf is stone cold dead. Zemlinsky adapts the story to whine—for 90 minutes—about how he, Zemlinsky, is ugly and how Alma Schindler (Mahler / Gropius / Werfel) couldn’t possibly love him. It is uninspired stuff that drones on forever as the drawn-out finale is chewed back and forth like cud. As far as autobiographical whining is concerned it’s not as bad as Bernstein’s insufferable Kaddish Symphony, but it’s not exactly dramatically compelling. The text doesn’t seem very naturally set to the music either, and the music is awfully tough for the voices. That John Daszak navigated the uncomfortable part of the Dwarf as well as he did was one of the marvels of the evening; Camilla Tilling’s naïve-yet-calculating infanta Donna Clara—Salome’s childish, dim-witted older stepsister—was a wholly pleasing performance, too. Paul Gay’s Major Domo (Don Estoban) was undermined by his character’s getup; an obnoxiously cliché-drenched freak with a ‘Garry-Oldman-is-Bram-Stoker’s-Dracula’ hairdo. That’s part of the production’s aim, of course: the whole birthday party of the infanta is the actual freak-show; the dwarf is not only regular size but reasonably handsome. His ‘ugly’ is in fact just a being ‘different’. But the grotesque element of the party-folk is so mild that the contrast never really works. Kriegenburg’s Wozzeck (also from the Bavarian State Opera) should have served as an example of how it’s done.